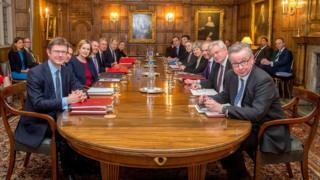 Chequers Brexit talks - a happy ending? Minutes after the scheduled end of the cabinet committee meeting at 22:00 GMT we spotted the prime minister speeding out of the back gates of Chequers in her jag, sitting alone in the back seat poring once again over her red boxes. Her colleagues tonight say that in that box there is now a broadly agreed opening pitch to the rest of the European Union - our agenda for the next phase of the talks that will determine the relationship between the UK and the EU for years, if not decades to come. The meeting is over, but the public explanation of the agreement won't come until next week. So what was the deal? One of the ministers in the room said that everyone was "rather happy" at the end, another said that the PM had "played a blinder". More realistically, perhaps, one of those senior figures described it as an "outbreak of unity for now". Brexit backers are busily spinning that "divergence has won", with the claim that the UK will go for so-called mutual recognition with the EU on goods, meaning there is no decision to follow EU rules slavishly for ever. But others say there has been compromise, the prime minister was in fact "firm with Boris", forcing the Brexiteers to come round to her way of thinking. As we've discussed before it is a development of the approach of "managed divergence", where basically the UK will stick closely to the EU in some areas, but on its own terms. But there is what was described by a key minister as a "growing realisation" that thousands of jobs are dependent on us voluntarily following EU rules in key goods sectors, describing the position as a "pragmatic Brexit." Surely not both sides trying to claim credit? Even though they are all playing nice-ish tonight, while trying of course to claim their position was the winning one, remember the rest of the cabinet, and then the Tory Party, has to get on board with this. And it wasn't a day of breakthrough. There was, I hear for example, no new detailed discussion of the Customs Union, with its potentially toxic implications for the Irish border. And if and once that is done, the prime minister's job is then to put it to Brussels in the next phase of the talks. One senior minister said they had reached a "sensible compromise which pitches an ambitious ask but recognises that we will be in a negotiation". After tonight the prime minister may seem to have permission from her top-ranking colleagues, but it doesn't mean that now she is almost ready to say what she wants next, that it is what she will get.